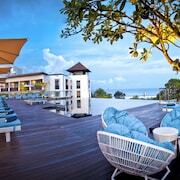 Located in Jimbaran Bay, this luxury resort is within 1 mi (2 km) of Samasta Lifestyle Village and Jimbaran Beach. Udayana University is 2.2 mi (3.6 km) away. 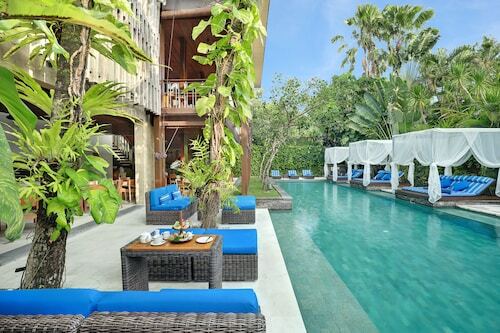 This family-friendly Seminyak hotel is located in a shopping district, within 1 mi (2 km) of Seminyak Beach, Petitenget Temple, and Petitenget Beach. Batu Belig Beach and Seminyak Square are also within 1 mi (2 km). This family-friendly Seminyak villa is located near the airport, within a 15-minute walk of TAKSU Bali Gallery, Seminyak Beach, and Eat Street. Seminyak Square and Double Six Beach are also within 2 mi (3 km). 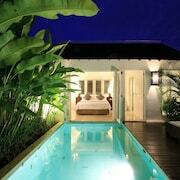 Located in Drupadi, this boutique hotel is within a 15-minute walk of Seminyak Beach and Double Six Beach. Eat Street and Legian Beach are also within 1 mi (2 km). 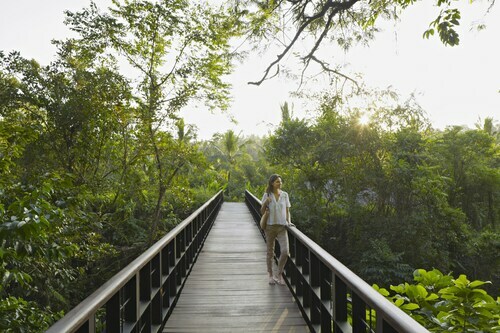 Situated in the historical district, this luxury resort is within 3 mi (5 km) of Blanco Museum, Campuhan Ridge Walk, and Ubud Royal Palace. Ubud Traditional Art Market is 2.1 mi (3.3 km) away. This family-friendly Seminyak villa is located in the entertainment district, within 1 mi (2 km) of TAKSU Bali Gallery, Eat Street, and Seminyak Square. Seminyak Beach and Double Six Beach are also within 3 mi (5 km). 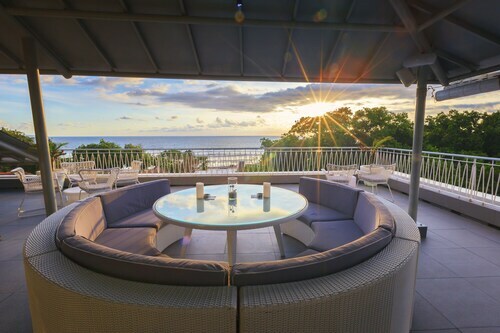 This family-friendly Jimbaran resort is located on the boardwalk, within a 15-minute walk of Jimbaran Beach, Samasta Lifestyle Village, and Honorary Consulate of Italy. Jenggala Factory and Benoa Square are also within 2 mi (3 km). 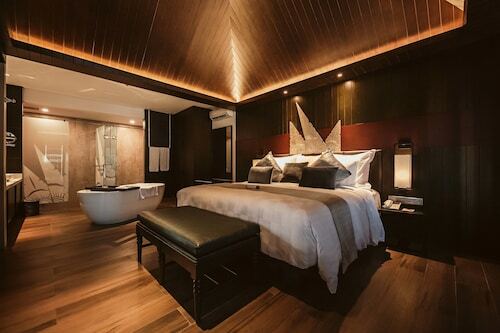 This family-friendly Seminyak hotel is located in the entertainment district, within a 15-minute walk of TAKSU Bali Gallery and Seminyak Beach. Eat Street and Seminyak Square are also within 1 mi (2 km). 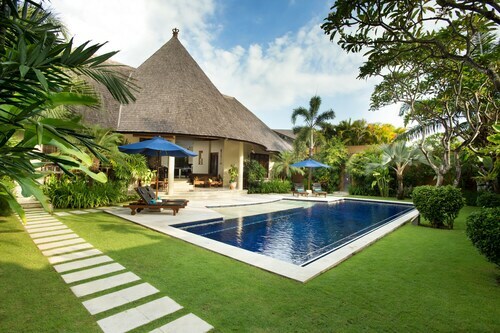 If you’ve got the opportunity to go to Bali, you go to Bali. No questions asked. But while you’re visiting the lush, beach-lined Indonesian island, it’s OK to be picky. After all, this is a luxury destination, right? 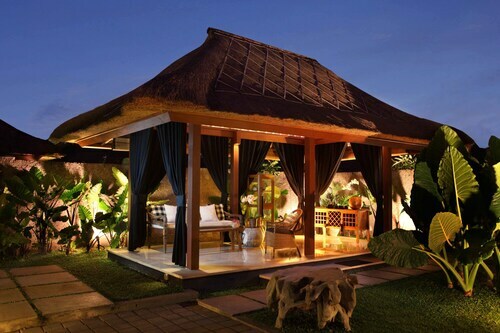 So pair those lazy sunbathing days and fine-dining nights with one of the best boutique hotels in Bali. You’ll be treated to custom amenities in a unique setting on top of once-in-a-lifetime experiences. Maybe you’ve been eyeing secluded cliffside temples on your lunch break, or you seriously need some beach time right now. Whatever ends up on your itinerary, one thing’s for sure: You need an awesome place to relax at the end of the day. 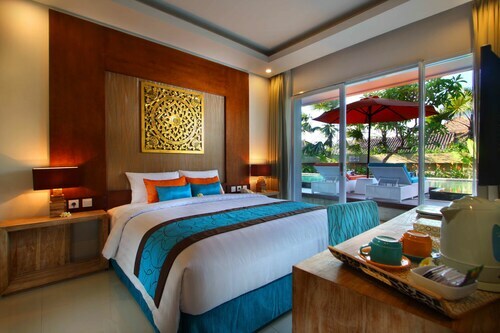 Browse our selection of Bali boutique accommodation and start booking! 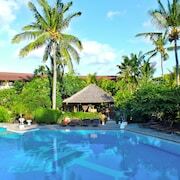 You’ll find many of the island’s most popular attractions and historic landmarks in and near the capital city of Denpasar, as well as Kuta on the south coast. 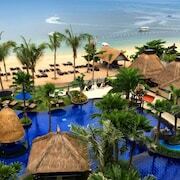 The latter is also home to some of our top boutique hotels in Bali. 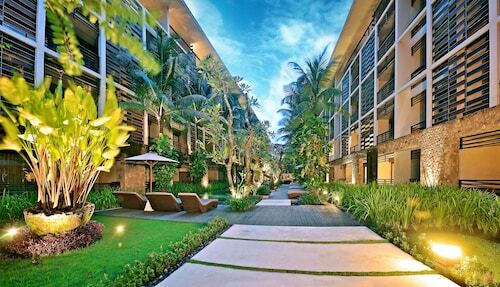 Make Kuta your home away from home for easy access to several kilometres of warm beaches and the cool, colourful streets at Kuta Square. Day or night, this open-air hub is a great place for casual dining, shopping and watching the sunset with your squad. 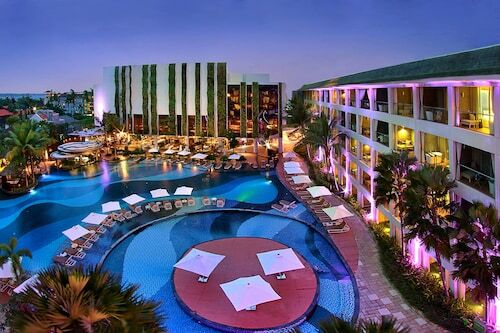 Stay at The Vira Bali Hotel and you’ll be halfway between the city centre and two beaches—Tuban Beach and Segara Beach. With only 56 guest rooms, this Bali boutique hotel offers personalised service and private balconies looking over the garden and pool. Treat yo’self at the full-service spa and indulge in local flavours any time of day with gourmet room service. 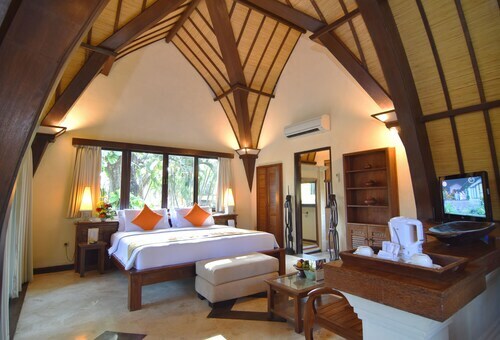 Just west of Denpasar, book Bali Niksoma Boutique Beach Resort and lounge at nearby Legian Beach. 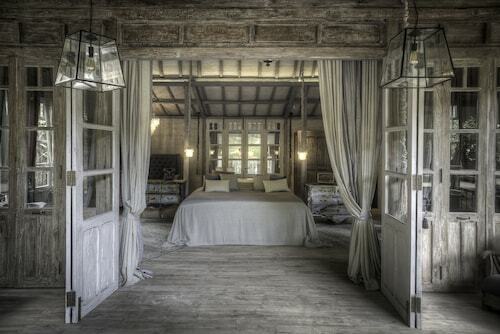 As soon as you step into this breezy Bali boutique hotel, you’ll breathe a sigh of relief. Seriously. The décor is simple and elegant, and each room has a private balcony or patio, so Indonesia’s natural wonders are always close by. Culture fixes are plentiful around here, too. Wander over to the Merta Nadi Art Market in Legian and fill your suitcase with hand-woven bags and intricate wood carvings. Yes, you do need a dragon hanging on your wall at home—why are you even asking? If you love to tour the world via your takeaway options, Bali will be your new BFF. It’s a truly international destination, and you’ll soon be eating your share of French fare, Scandinavian savouries, crafty cocktails, and of course regional favourites. Balinese cuisine is known for being spicy and aromatic, so hold on to your sunhats when you settle in for a feast! Depending on what you want to eat, you may need to plan ahead, too. Bebek betutu—super slow-cooked duck—takes several hours to prepare, but this tamarind-seasoned delicacy is well worth the wait. Pair it with Bali’s beloved coconut-infused side, lawar, and you won’t want to leave. You won’t have to leave if Wotif has anything to say about it—at least not until your flight is ready to take off. 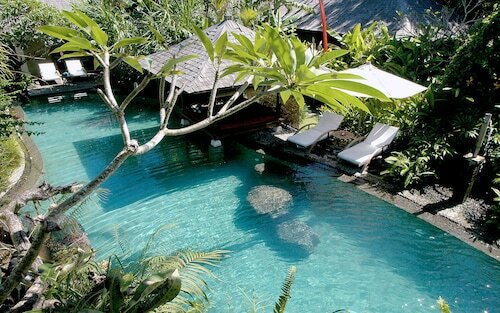 We’ve got the best deals on boutique Bali hotels, so you’ll save while you splurge on a one-of-a-kind holiday!